After the algae bloom come the worries on Beijing’s air quality. To improve this, the local government took a drastic measure : cars will be allowed to drive on alternate days. This measure is due to decrease by up to 60 percent the pollution of the 3.3 million cars of the city. Meanwhile, new subway and bus lines were opened. Will all these measures be enough for athletes to have a good air quality ? It is to be hoped as many eyes worldwide will look at China’s efforts on pollution. Traffic in China’s capital was lighter Monday but hazy skies still hovered over the Olympic host city 18 days before the Beijing Games despite factory closures and a ban on more than a million cars. The city’s last-ditch bid to shift pollution was launched Sunday and includes the car ban, shutting down 150 polluting factories and ordering building sites to stop work that could cause pollution. Vehicles with odd- and even-numbered licence plates are banned from Beijing’s roads on alternate days. (…) In effect until September 20, the ban will force an additional four million commuters a day to use public transport, according to city officials. To prepare for that, Beijing has opened three new metro lines and plans an additional 34 new bus routes while introducing staggered working hours at state enterprises. More than 65,000 taxis are also in service. The car ban is part of a wider effort ahead of the August 8-24 Games to free-up traffic and clear the air in Beijing, which is one of the world’s most polluted cities and is typically wrapped in a blanket of industrial haze. To ensure that traffic deadlock will not affect the Games, Olympic traffic lanes running for 286 kilometres (180 miles) on key roads have been set aside for athletes and officials. But pollution appears more difficult to deal with. Skies above the city of more than 17 million were still hazy Monday, although the thick smog that has covered the city in recent months had lifted in the days before the car ban began. Emissions from the city’s 3.3 million vehicles — a number increasing by 1,200 new cars a day — remain the chief source of Beijing’s pollution. International Olympic Committee chief Jacques Rogge warned last year that poor air quality during the Games could result in the suspension of some events, particularly endurance races such as the marathon. Beijing has already spent 20 billion dollars over the past 10 years in an environmental clean-up, but concern about poor air quality persists. Experts quoted in state media said they expected to reduce vehicle emissions by more than 60 percent, eliminating 118,000 tonnes of pollutants during the two-month vehicle ban. Last year, Beijing conducted an experimental ban over fours days which officials said was a success, although it failed to shift the haze over the capital. 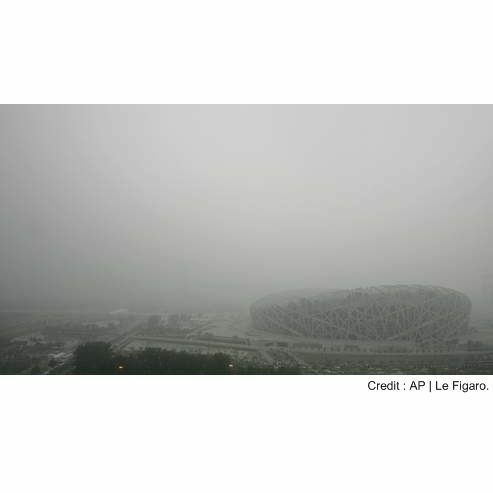 “We believe that these additional measures will ensure good air for the Olympics and athletes have nothing to worry about,” said Sun Weide, spokesman for the Olympic organising committee.